A Colorado family may need a new car after a bear became trapped inside and left an unbelievable path of destruction in its wake. The bear found itself trapped inside a Subaru in Conifer, Colorado on Monday. The Jefferson County Sheriff’s Office released a video showing the bear being released – and documenting the utter carnage it left behind. 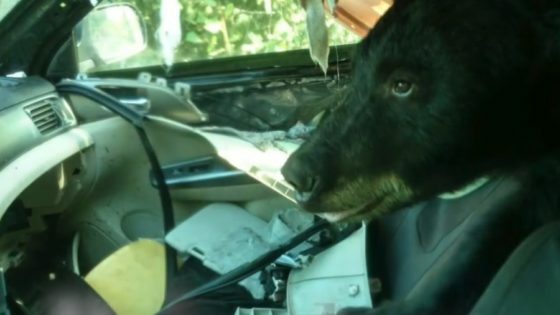 “We’ve often warned that leaving your car unlocked makes it easier for thieves to steal items, but as we’ve now seen twice this past week, it also makes it easier for bears to climb in and make themselves at home,” the sheriff’s office said said in a Facebook post. Eyeing the animal inside, officers opened the car door from a safe distance using a rope. A small black bear soon climbed out and quickly fled the scene. A deputy then approached the car to assess the damage, and it isn’t pretty. The bear almost tore the car apart inside, ripping the upholstery and interior fittings to shreds. After ransacking the car, the bear snacked on a banana it found, leaving it half-eaten in the cup holder before it fell asleep in the vehicle. Contributed by RT.com of RT.com.